Today is Pancake Day: Shrove Tuesday. Shrove Tuesday gets its name from the ritual of shriving, when the faithful confessed their sins to the local priest and recieved forgiveness before the Lenten season began. Historically, Shrove Tuesday also marked the beginning of the 40-day Lenten fasting period when the faithful were forbidden to consume meat, butter, eggs or milk. However, if a family had a store of these foods they would certainly spoil by the time the fast ended on Easter Sunday. What to do? Solution: use up the milk, butter and eggs no later than Shrove Tuesday. And so, with the addition of a little flour, the solution quickly presented itself in... pancakes. Today, the Shrove Tuesday pancake tradition lives on in Western Europe, the United States, Canada and Australia. It is most associated with the UK, where it is simply known as Pancake Day with a traditional recipe that looks to all the world more like a French crepe rather than the 'mile-high' stack so popular on National Pancake Day in America. 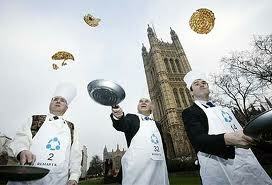 In many places in the world, there are pancake flipping contests. 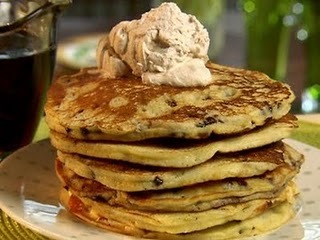 You may not be an expert flipper, but you can certainly enjoy making the following pancakes today! And to think I had mere granola. These look sooooooo good! Thanks, and did you see the Chocolate Cereal yesterday? LOL! There's nothing better than pancakes -- especially with chocolate! These look yummy. Thanks for visiting my blog, You Little Tarte.